The Specialty Tools and Fasteners Distributors Association trade show has just come to a completion and Marc from Homefixated was there to cover all of the latest tools news and after show parties. Marc discovered some really cool tools while making his rounds, one of them being the tool-less blade change Bosch Multi-X that I wrote about a couple of months ago. According to the photo that Marc took, the new Bosch tool-free Multi-X will be known to us as Model MX30, and he also states that the MX30 will have 3-amps of power. 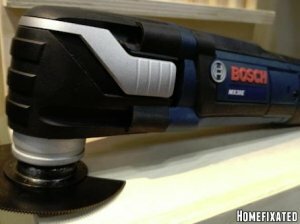 The tool-lees feature is just one more step in the right direction for Bosch and narrows the gap between Bosch and Fein even more. Now the only thing that separates the tools is the difference in total oscillation degrees, though I don't know how much 2.8-degrees vs 3.2 degrees really affects performance. The Bosch MX30 might be the biggest news of the event, at least to me, but Marc has even more coverage of the show at his site. Be sure to head on over to Homefixated to read about the 14.4V cordless Fein oscillation tool, the digital t-bevel, or the padlock with built in alarm.